As much as I love good food, I hadn’t experienced a tour focused on agritourism before. I’m glad to say that I learned a lot about Vietnamese food and culture from digging into the country’s agricultural roots for a day. 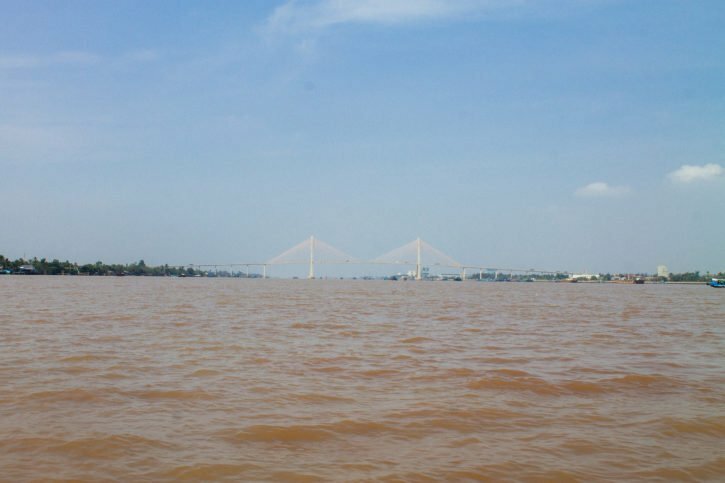 The Mekong is a special river in Southeast Asia. It’s the world’s 12th longest river and it runs through six countries (China, Myanmar, Thailand, Laos, Cambodia, and Vietnam). There’s a good chance that if you’re backpacking through the region, you’ll run into this river multiple times. It acts not only as a major trade route in Asia, but also as an agricultural gem and a rich area of biodiversity. 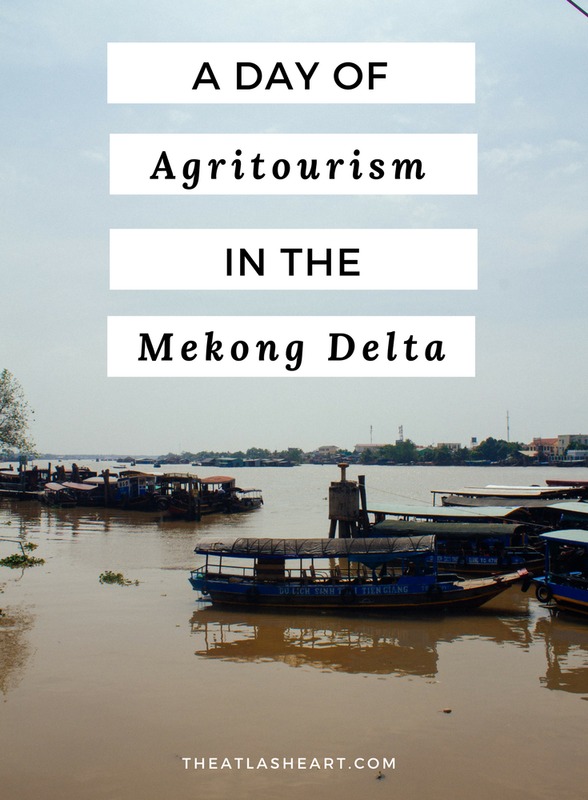 The farming conditions are some of the best at the Mekong Delta, which is where the Mekong ends in Vietnam and empties out into the sea. 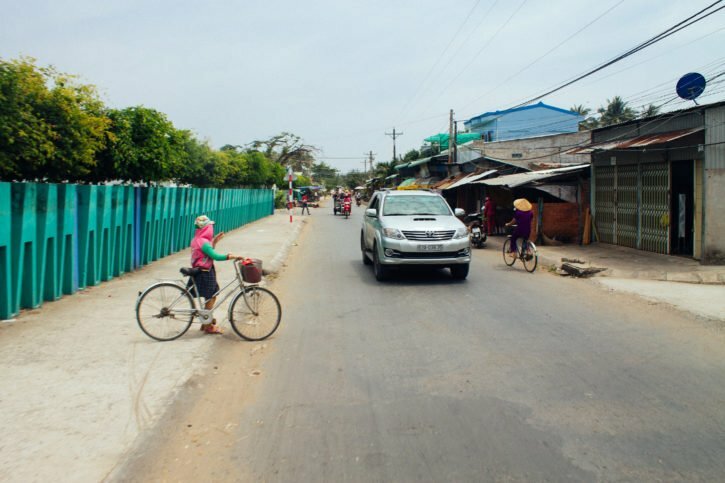 This area is huge for farming and it makes up a lot of the agricultural industry in Vietnam. In fact, the Mekong Delta produces more than a third of the country’s food crop from just ten percent of the land in Vietnam. 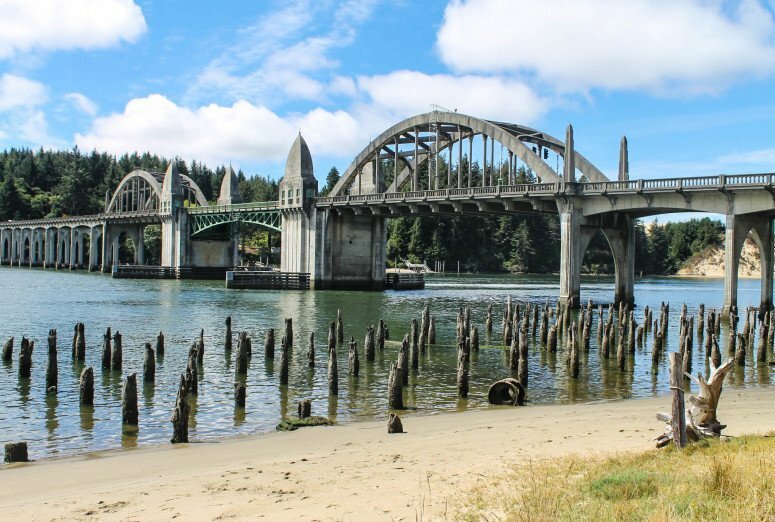 In a nutshell, this region is known for its vibrant diversity, nutrient-rich soil, and daily life that revolves around agriculture and the river. This is where we were going for our day with Intrepid Urban Adventures. The hour and a half drive down to the Mekong Delta. 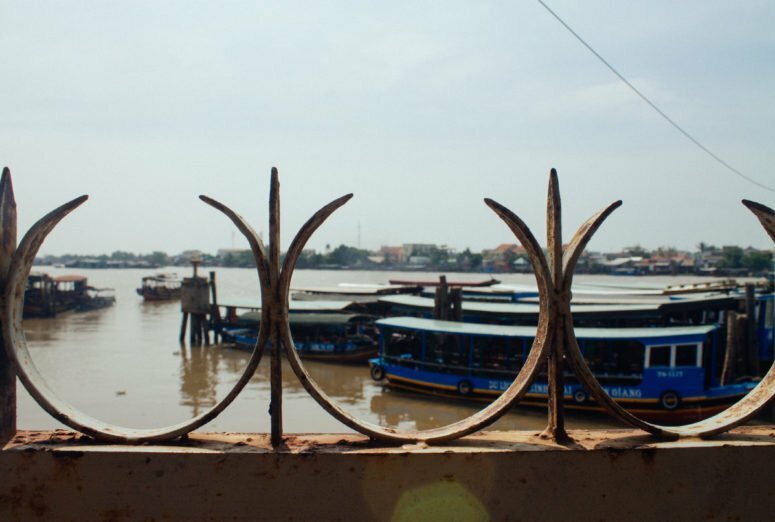 After finding our group in front of the Saigon Opera House, we hopped in a minibus and began the long hour and a half drive down to the Mekong Delta. There were 10 of us in total, 11 with our guide. The group was a diverse bunch from different countries and a wide range of ages, but it seemed to mainly be couples and families. Duy, our local Vietnamese guide, would periodically tell us more about what we were going to see and explain the history of the region during the drive. We eventually made it to the boat dock in Mỹ Tho, after a quick pit stop for Vietnamese coffee, of course. Our group had a little wooden boat to ourselves that was powered with a motor and a friendly boat captain. 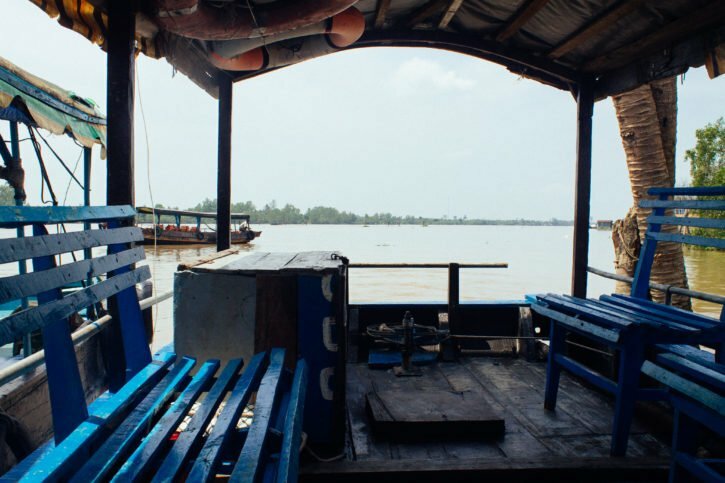 We chugged along the busy river with boats flying by in every direction, the breeze on our face, and the murky ripples of the Mekong below us. This was clearly where the action happened in Vietnam. The hub of the agricultural scene was fast-paced and full of energy. It was a countryside version of Ho Chi Minh City, but more laid-back and overflowing with impressive nature everywhere. I was experiencing what life was like on the Delta first hand and trying to take in the action as much as possible as it sped past me. We reached our first stop and jumped out, finding ourselves with tropical fruits in front of us and a live music show to enjoy. Half of the fruits I didn’t recognize, but I asked Duy to go through each one for me. They were sweet, delectable, fresh, and juicy. 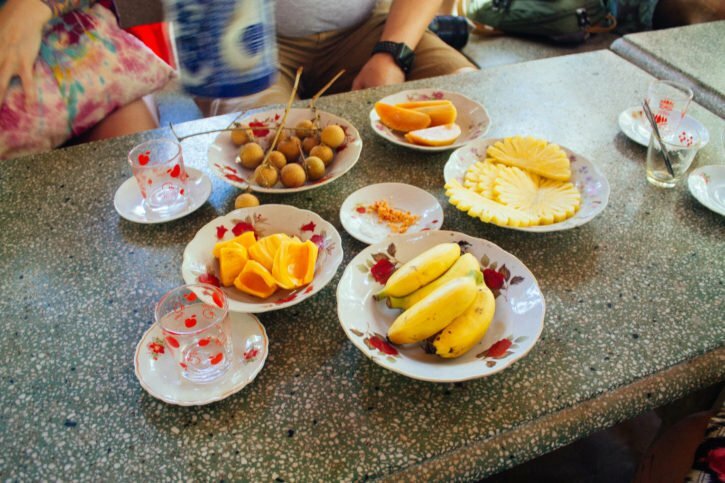 We tried everything from dragon eye fruit (similar to lychee), to jack fruit, banana, sapodilla, and ate them the traditional way dipped in chili and salt – sour fruits with chili, sweet fruits with salt. There were a few different performers for the live music portion, and we sat back for around 15-20 minutes to listen to the music from the Delta. 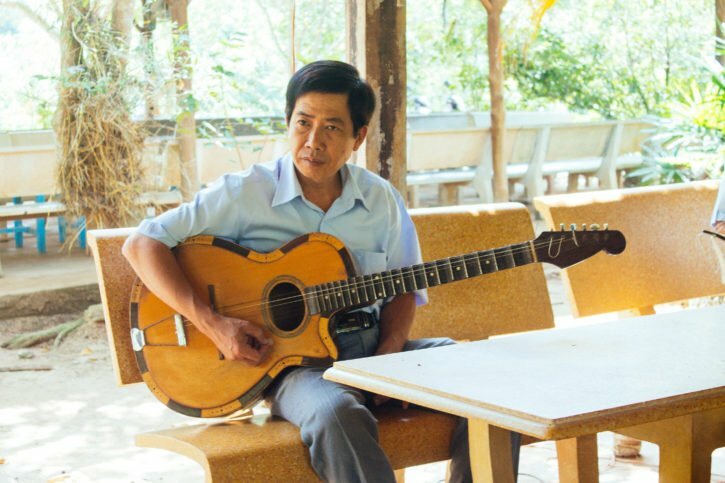 There was singing, guitar, and more traditional instruments like the Dan Nhi fiddle. After the tropical fruit and music, our next stop was walking through a traditional Delta house. It was compact and simple, but practical at the same time. The bed was in the kitchen and for sleeping in as well as for eating on. In fact, it seemed like the house in general revolved around the kitchen, which isn’t surprising for a region that is so focused on food. 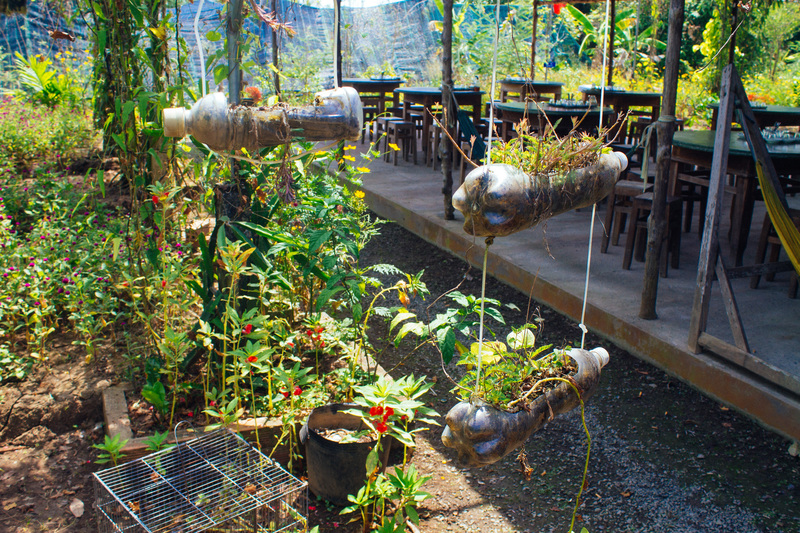 We walked along a short path to get to our next stop, an eco bee farm to try some fresh honey and tea. We were able to taste the honey straight from the honeycomb, with the bees swarming around us. Surprisingly, we didn’t have to wear any protective gear even though we were essentially stealing honey from them. Apparently Vietnamese bees are not the least bit aggressive, and it’s very rare for them to sting humans. 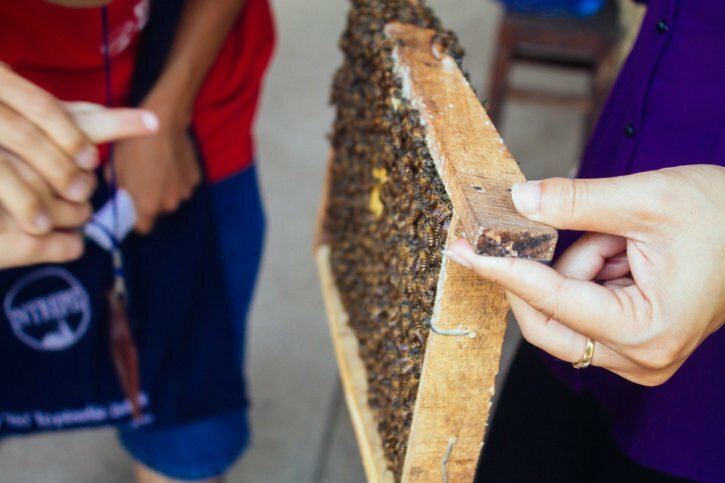 Our guide Duy even encouraged one young boy who had a bee allergy to try the fresh honey as well, which he did. It’s the first time I’ve ever tried honey straight from the honeycomb and it was delicious. I’m not generally a honey person, but this was some of the best honey I’ve tried. We sat down to have fresh honey tea with kumquat and learn about the many health benefits that Royal Jelly has. My favorite though was the honey coated snacks they laid out for us, so good! Fresh honey with hot water and kumquat. We scrambled back on the wooden boat and went to our next destination, a coconut candy factory. 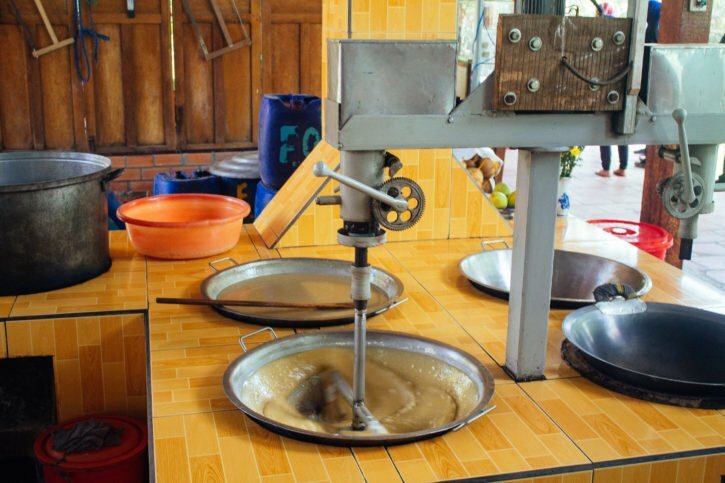 We watched how they made fresh coconut milk and the delicious candy that we were able to sample later on. Coconut candy in the making! I never knew coconut candy was so tasty! They had interesting flavors to choose from, including durian, coffee, tamarind, and more. I tried my fair share with the excuse that I needed to try every flavor for journalistic purposes, of course. So many flavors, gotta catch ’em – I mean – eat ’em all. 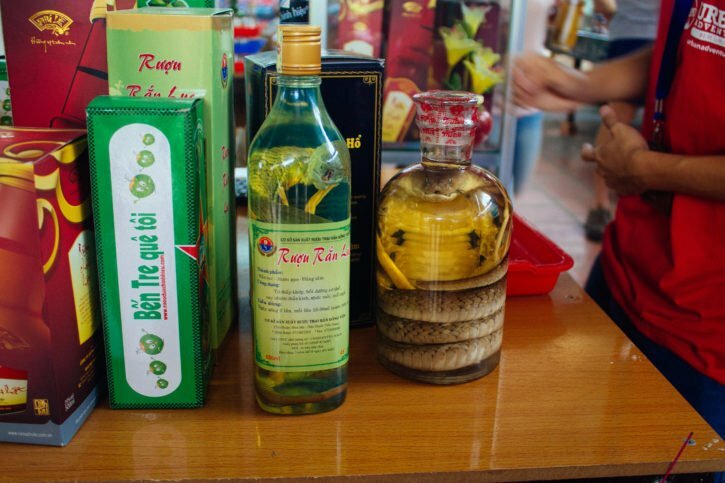 Once I was candied out, we had the chance to try some cobra rice wine. 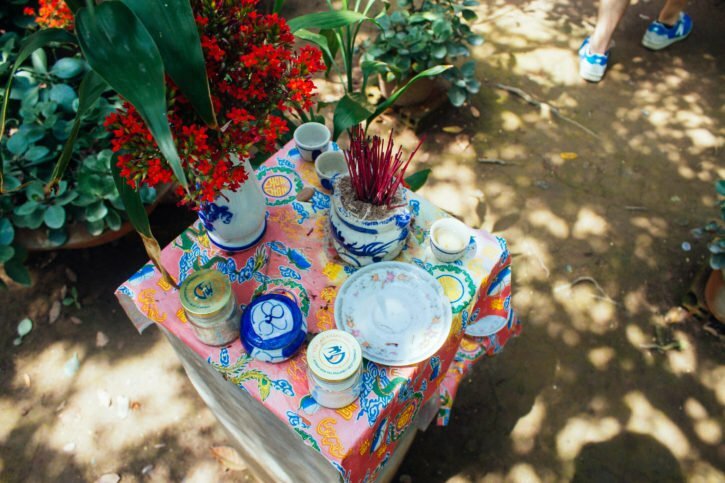 Now, I’ve been to snake village in Hanoi so I’ve already tried rice wine with things like snake blood and bile in it. I found this rice wine to be very similar, as in very alcoholic. I find that no matter what interesting items are put in rice wine in Asia, the flavor of rice wine itself is so strong that it is usually all I can taste. 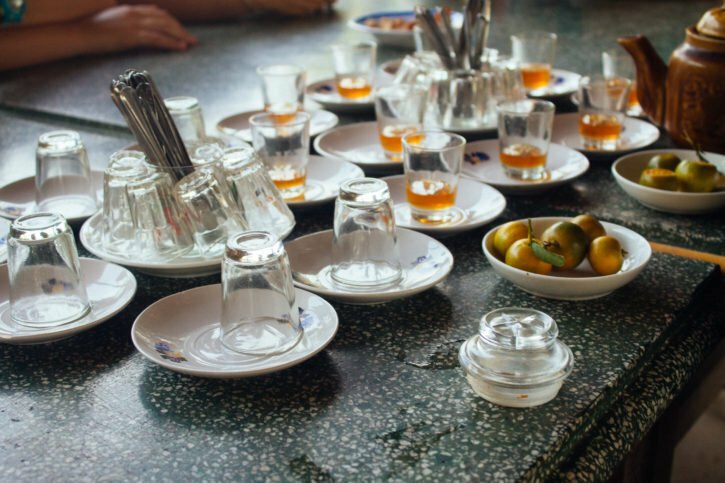 So, Kelsey and I tried a shot each of rice wine that was soaked with cobra and scorpions (sorry mom, I know you’re probably making a disgusted face right now). Cobra and scorpion rice wine. Our lunch came toward the end of the day. We had a selection of different Vietnamese dishes that I’d never tried before. 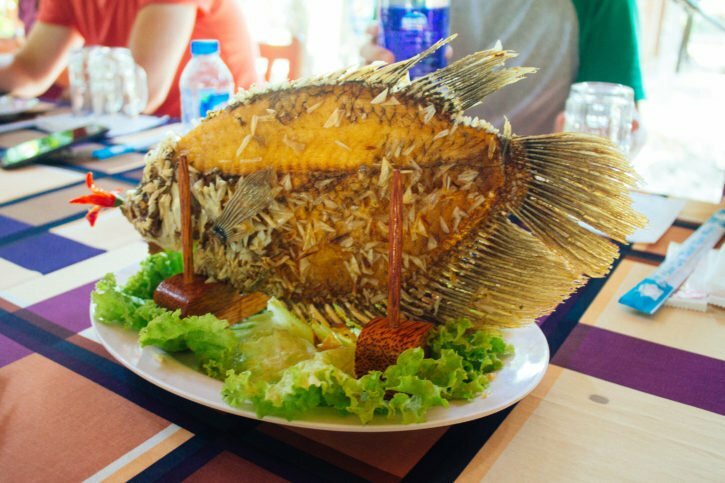 The highlight was the Elephant Ear fish that is a popular dish in the region. They literally cook the fish whole and put it on a stand where the group can just pick off the meat they want. It melts into your fork. We tried it with lettuce, mint, and some chili and it represented some of my favorite things about Vietnamese cuisine – fresh, simple, and full of flavor. After lunch, we had some chill time in the hammocks at the restaurant before our last activity for the day – a traditional sampan boat ride. A sampan is a flat-bottomed wooden boat that is originally from China, but is also the traditional boat in this region of Vietnam, not only for transportation but for fishing as well. We had a peaceful meander down one of the canals that led back to the busy Mekong. It was nice just having 20 minutes of quiet, with very few boats or people around and no motors – just one guy using a long paddle to propel the boat forward. 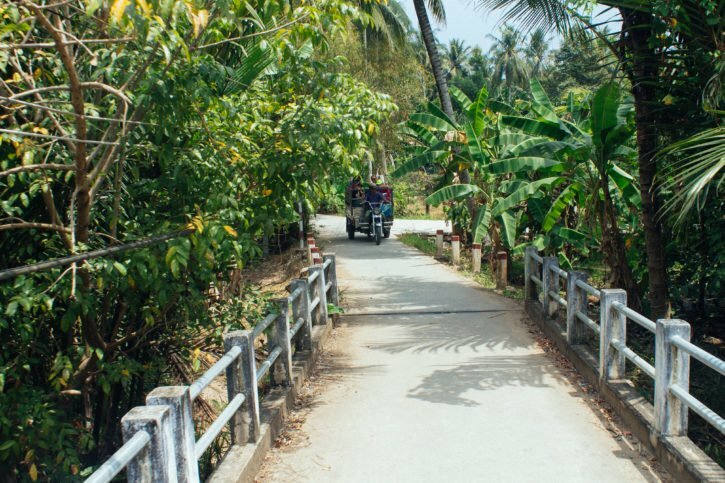 When we got back to our motorized boat, we were each handed fresh coconuts to enjoy as we made our way back to Mỹ Tho. The rain came just as we hopped back in the van, and we dozed in and out on our journey back to Ho Chi Minh City. I first have to admit that I’m not generally an organized tour person. I usually like to set out to explore on my own or with a small group, but we only had a short time in Ho Chi Minh City and I wanted Kelsey to be able to experience the Mekong Delta this trip. For its convenience and organization, I would definitely recommend this tour. 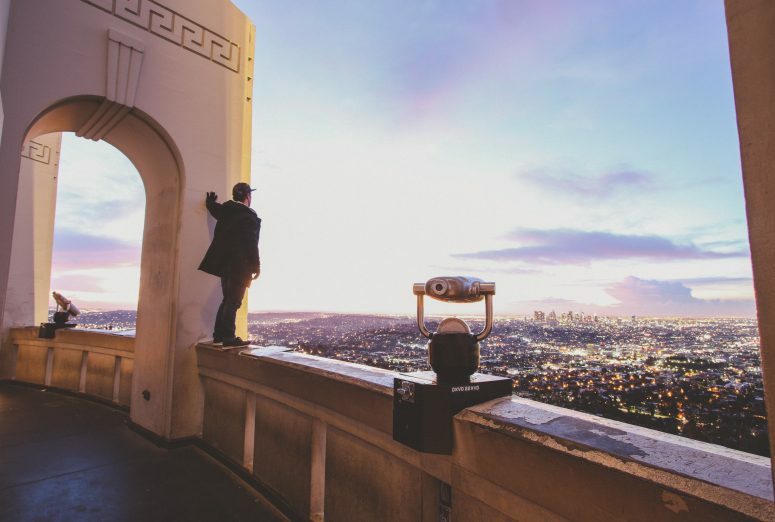 If you’re looking for something that is planned out where you don’t have to think about much and you can just relax, this is a good tour to go on. 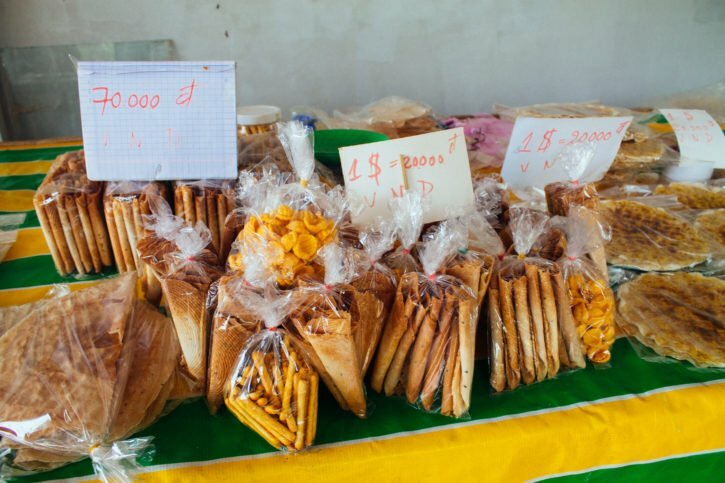 The one downside to the Mekong Discovery, however, is the price tag. 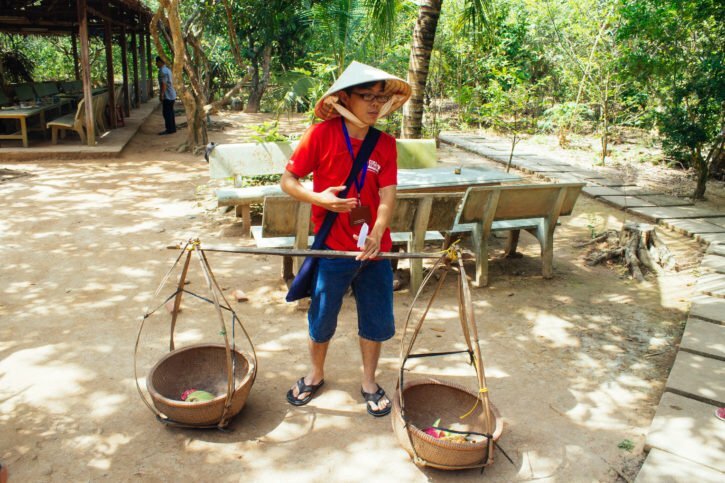 At US $65 per person, it’s a lot for a tour in Vietnam. I found that there were similar tours that left from Ho Chi Minh City, and did most if not all of the same stops we did on this tour, but were priced at around US $11. The one aspect to note with the cheaper tours is that they’ll probably be much larger groups, and not quite as personalized with the amount of information you get. In essence, you get what you pay for. With that said, that’s still a huge difference in terms of price and it’s one aspect you have to think about when going with an international tour company, the tour prices are similar no matter what country you’re in. 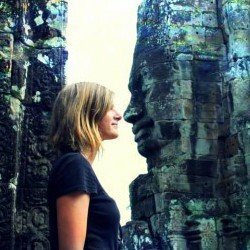 In Europe, $65 for an 8 hour tour would be great, in Vietnam it’s a little incongruous with what other tour providers are offering. The other thing to note was how touristy the tour itself was. I know, that’s hypocritical to say since I did book a group tour after all, but it was quite touristy all the same. As I mentioned, it was mainly families and couples on the tour, but Kelsey and I were probably the only backpacker/flashpacker types. 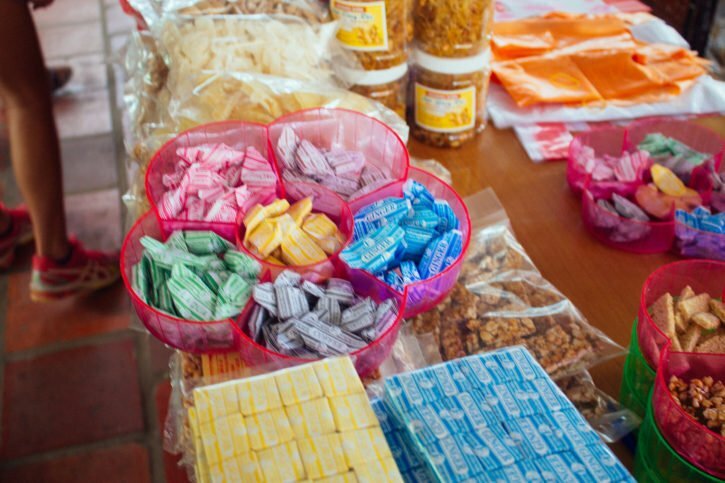 There were always souvenirs to buy at each stop, and it didn’t really feel like an immersion in the local culture. It felt more like the locals were putting on a show for the foreign tourists who were making their quick stop for the day. And it didn’t help that all of these stops were the stops that many other tour groups go to, which made it seem more like a packaged tour feeling. That’s not to say that I didn’t enjoy the tour, just that I expected more of a local experience for the price tag and also how Urban Adventures specifically markets themselves. 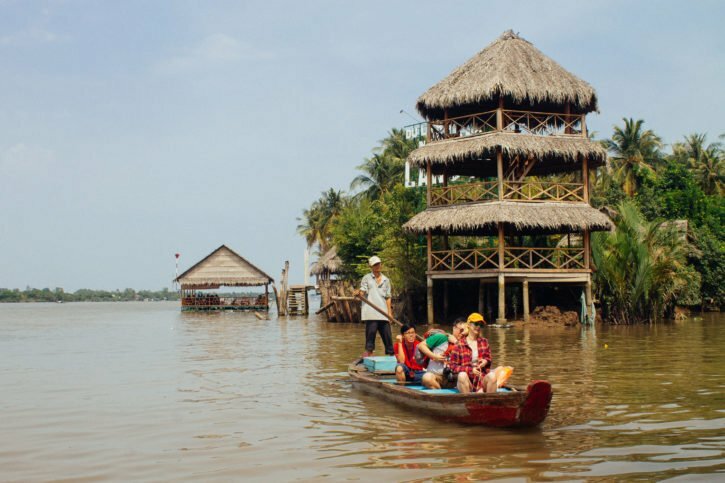 I think this tour would be perfect for families and older couples who want to get a good overview and knowledgable look at the Mekong region, but I don’t think it’s geared so much for the more adventurous or younger budget travelers. Of course, this was my first Intrepid tour, so I would be interested in going on more in the future in other countries to see how they differ. 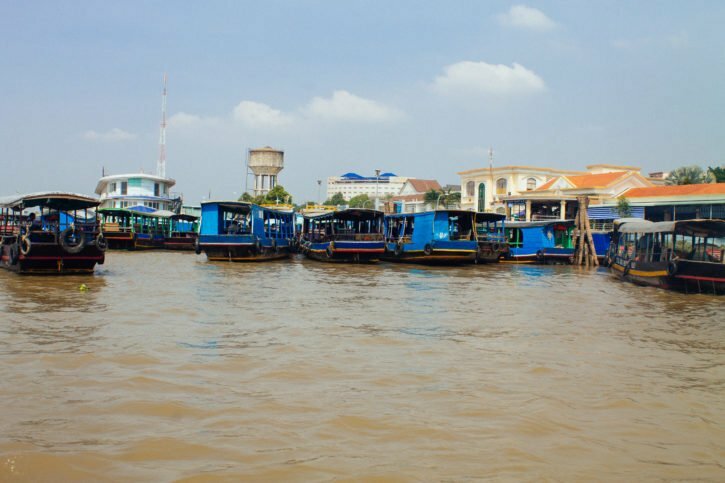 If you’re still unsure on whether the Mekong Discovery tour is right for you, here are a few other points that separate this tour from the more inexpensive ones that leave from Ho Chi Minh City. It’s up to what kind of experience you’re after and also what your budget looks like. Global Experience, Local Knowledge: Intrepid is a company that is a strong global brand with global experience and qualified tours from local experts. This tour is the same quality as what you would get for tours in Australia or the US. Small Groups – From 1, maximum 12: Intrepid aims to bring clients their best.day.ever holiday, and their group tours are mainly at the small size of maximum 12. Guaranteed Departures: Your booking is guaranteed to depart even with one client. You don’t have to be worry that the tour will not run if there is not enough people, or have to pay a higher rate if it’s a smaller group. Pick up and Drop Off at Central Hotels or Central Meeting Point: For most day tours, you will be picked up and dropped off at your centrally located hotel. Or as was the case with this tour, we met at a central meeting point and we were dropped off at our hotel at the end of the tour. 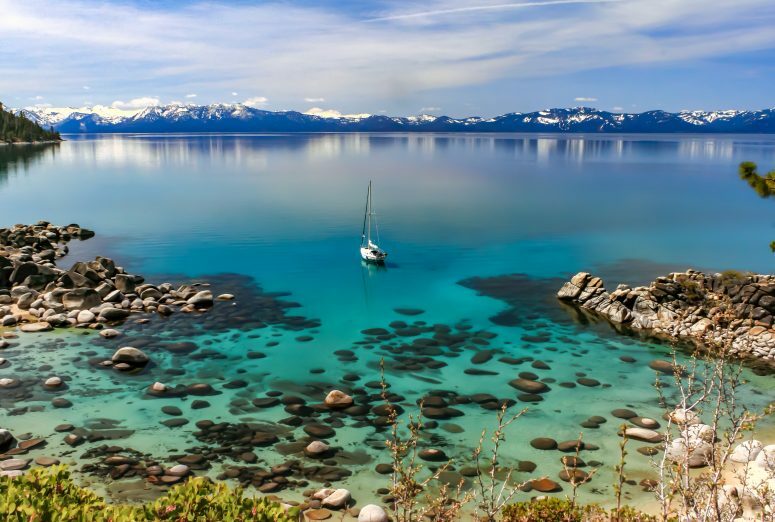 Responsible Travel: Intrepid is a proud sustainable and responsible travel company. 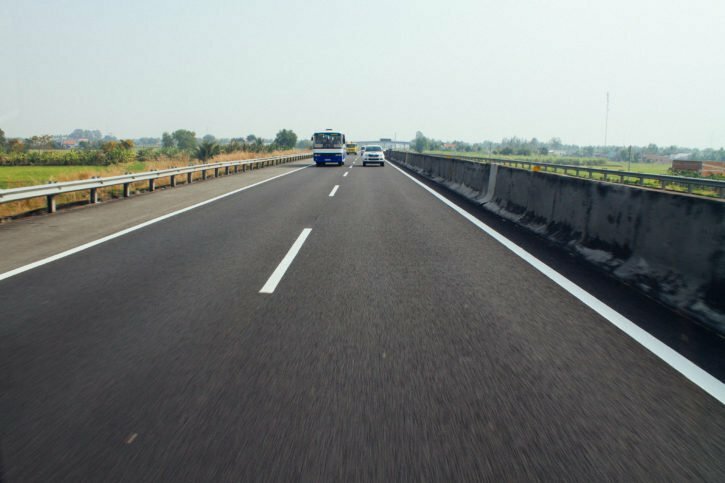 They aim to use lots of local suppliers and local services, and they support local people and encourage their clients to travel with them responsibly. Expert Local guides: Intrepid uses mainly full-time qualified local guides who are highly trained about the company, the Intrepid tour style, and ways of giving information, acting responsibly, and providing groups with a lot of local tips and fun facts. Have you been on an Intrepid tour before or experienced agritourism in a foreign country? It was such an interesting day out and I’m glad I was able to experience it with Intrepid and one of my best friends from home. Note: Intrepid Urban Adventures was kind enough to provide me with a discount for this tour, but all opinions, as always, are my own.